Dagupan City – 31 December 2009. In a letter addressed to the priests of the Archdiocese of Lingayen-Dagupan, Archbishop Socrates B. Villegas, DD urges the clergy in their communities and parishes “to help bring about a more inspiring and truly edifying liturgical worship.”. Below is the full text of the fraternal letter to the clergy of the Archdiocese of Lingayen-Dagupan. San Fabian – 27 December 2009. Typhoon Cosme unleashed its fury last 18 May 2008 and destroyed hundreds of properties, including houses, mainly along the coastal areas of Pangasinan. San Fabian was battered by the strong winds of Typhoon Cosme which at that time blew away the roof of the rectory, the parish church and several buildings of the parochial school. 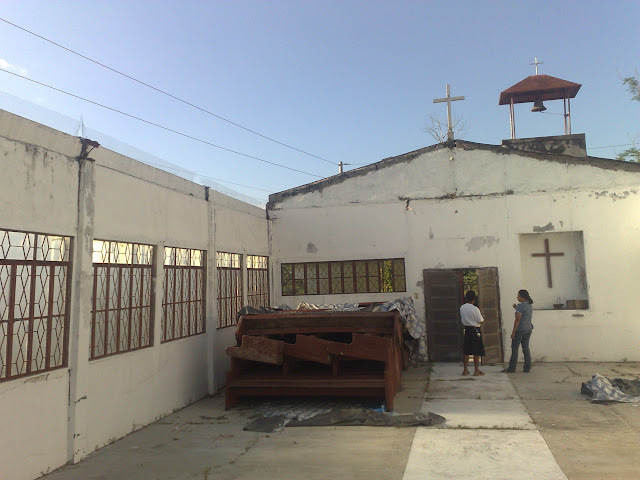 The chapel of Barangay Binday was one those destroyed by the strong winds of Typhoon Cosme. Its roof was completely blown away; its walls were rendered dangerously unstable. The chapel was immediately abandoned, but plans were also immediately made to reconstruct it. For more than a year, masses were regularly celebrated not in the chapel but at the Day Care Center, and sometimes at residential houses of the faithful. Understandably, mass attendance went down. While the people were raising funds for its reconstruction, they were hoping and praying that their chapel would soon be opened once again for the celebration of the Eucharist. On 9 October 2009, another calamity struck the province of Pangasinan. San Fabian was not spared by the rushing floodwaters brought about by Typhoon Pepeng’s continuous downpour which inundated almost the whole province of Pangasinan. Twenty-three houses in Barangay Binday were swept away by the rushing waters of the swollen Bued river which also destroyed the irrigation canals of the place. In 4 November 2009, Fr. 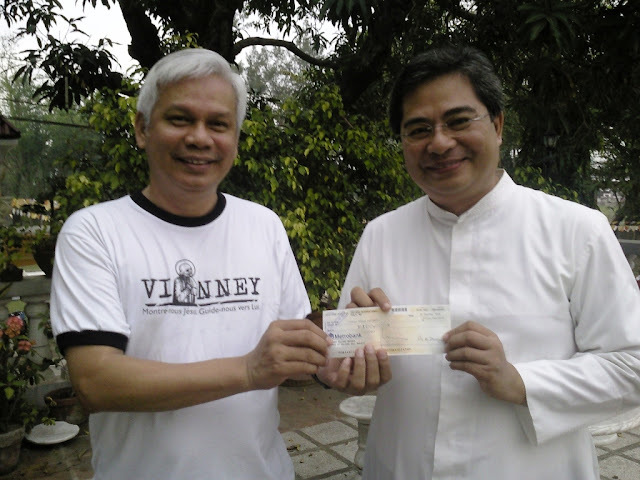 Francisco Ungria, Jr., a native son of San Fabian, and presently the parish priest of St. John the Baptish Parish, San Juan, Metro Manila, brought with him a check in the amount of Phil. Pesos One Hundred Thousand (P100,000.00). In lieu of the traditional gifting of the company to their clients, Colliers International has on behalf of their valued clients donated the amount to assist the reconstruction efforts of the people of Binday. Immediately, the much needed materials for the reconstruction were bought; while the labor was provided by the people, “tagnawa” or “bayanihan” style. The reconstruction of Binday Chapel started immediately. A little more than a month later, the reconstruction was finished. Binday Chapel is dedicated to the Holy Family whose feast falls this year on 27 December 2009, the last Sunday of the year. The Most Rev. Socrates B. Villegas, DD went to Barangay Binday to join the people in celebrating their fiesta, and to bless the newly reconstructed chapel. 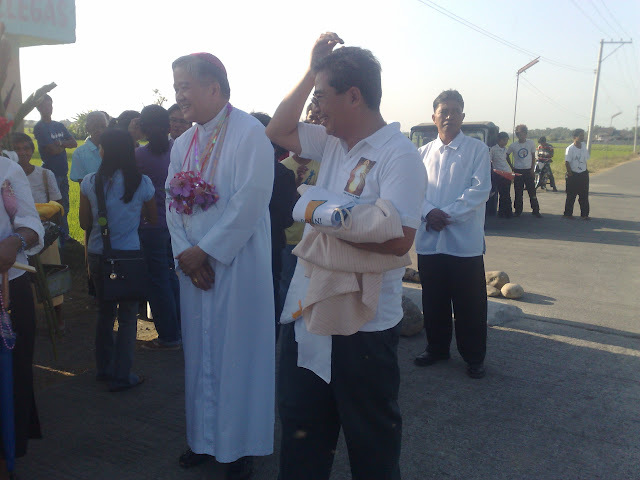 Archbishop Villegas was welcomed by the residents at the barangay boundary. The Anonang Drum and Lyre Corp was there to welcome the archbishop on his first visit to a barangay in San Fabian. There were hundreds who participated in the procession carrying the patron of the place, and the image of the Divine Mercy. Initially, the people adorned a local “koliglig” for the good archbishop to ride during the procession, but Msgr. Socrates Villegas opted to walk with the people. The mass was celebrated in the chapel with hundreds in attendance. The Archbishop spoke about the love for God manifested by the people of Binday as shown in their desire to reconstruct their chapel in spite of the many difficulties they had encountered brought about by the calamities. Archbishop Socrates B. Villegas, DD with Fr. Oliver E. Mendoza, parish priest and Rev. Estephen Espinoza, parish deacon. To see more pictures of the Fiesta and blessing of the chapel in Binday, please click HERE. 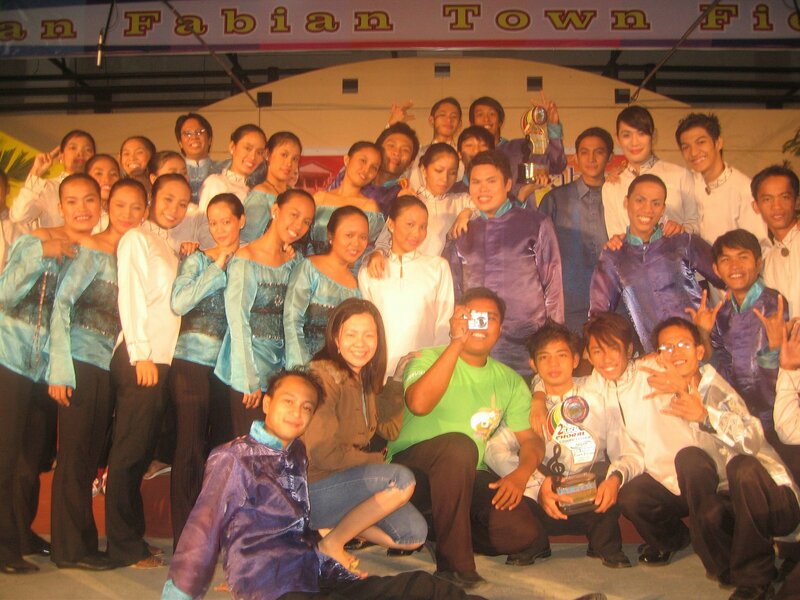 19 December 2009 – San Fabian. 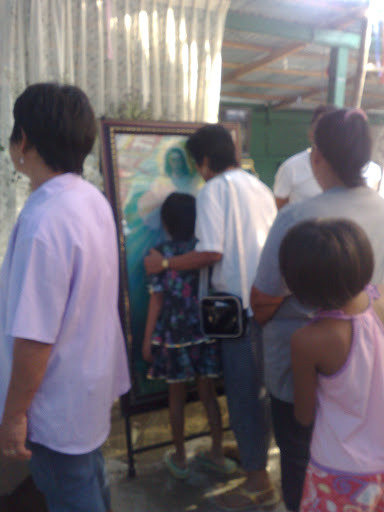 After almost seven months, and weekly visitation of the different barangays of San Fabian by the images of the Divine Mercy and the Blessed Virgin Mary, the Barangay Visitation ended today, 19 December 2009. The last barangay to hold the visitation was Barangay Nibaliw East. On 12 December 2009, Saturday Nibaliw East held its farewell liturgy after welcoming the sacred images last 15 December 2009 from Nibaliw Center. The images stayed in the barangay hall since the barangay has no chapel yet. The residents held a procession around the barangay on 17 December 2009. Barangy Nibaliw Center welcomed the sacred images from Nibaliw West. The images stayed in the barangay for four days and three nights before they were finally brought to Barangay Nibaliw East, the last barangay to hold the Visitation. 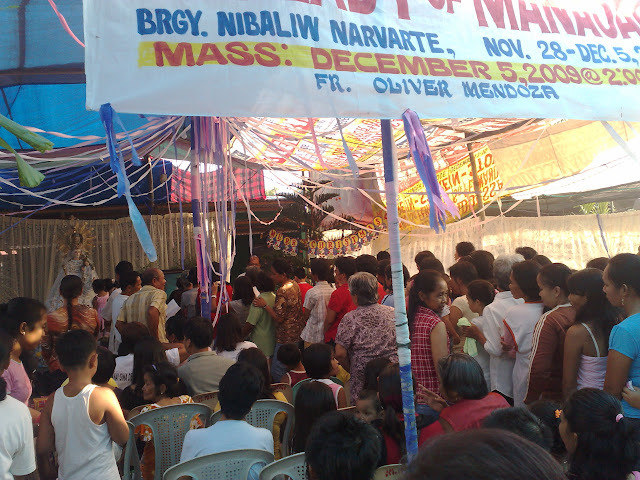 The farewell mass of the Visitation in Barangay NIbaliw was held on 19 December 2009. There were 50 children who received the Sacrament of Baptism. Fr. Oliver E. Mendoza celebrated the mass and the sacrament of baptism. The images were then brought to the Parish Church from Nibaliw East. The procession carrying the images marked the end of the Barangay Visitation. 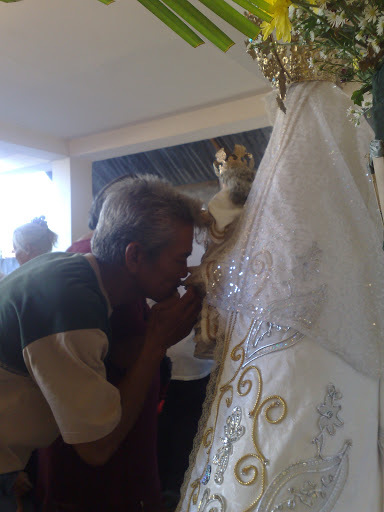 A devotee kissing the Blessed Virgin Mary. To see more pictures of the Barangay Visitation in Nibaliw West, please click HERE. To see more pictures of the Barangay Visitation in Nibaliw East, please click HERE. San Fabian -- 8 December 2009. To celebrate the Feast of the Immaculate Conception, the Parish of St. Fabian, Pope and Martyr, held an early gift-giving program to marginalized families of the parish. The gift-giving activity was dubbed "Panangaro na Ina, Regalo na Ina" showing the love of the Blessed Virgin Mary and the Gift she had given us through her Son could be our model in sharing and loving our fellowmen, especially the most vulnerable in our community. "Panangaro na Ina, Regalo na Ina" is a project program of the Social Action Apostolate of the Archdiocese. The different parishes and chaplaincies of the archdiocese simultaneously held this gift-giving activity. The gifts consisted of kilos of rice, noodles and canned goods, including clothes which were received by the archdiocese through the Social Action Apostolate from different groups and individuals in the Philippines and from abroad. There were 150 families who took part in the "Panangaro na Ina, Regalo na Ina." The parish held the activity at 2 o'clock in the afternoon. The families were gathered at the parish Church where a sharing on the Divine Mercy was done. The parish has had a strong devotion to the Mercy of God and considers the recent program as a corporal work of mercy. A Holy Mass was celebrated with the families. Fr. 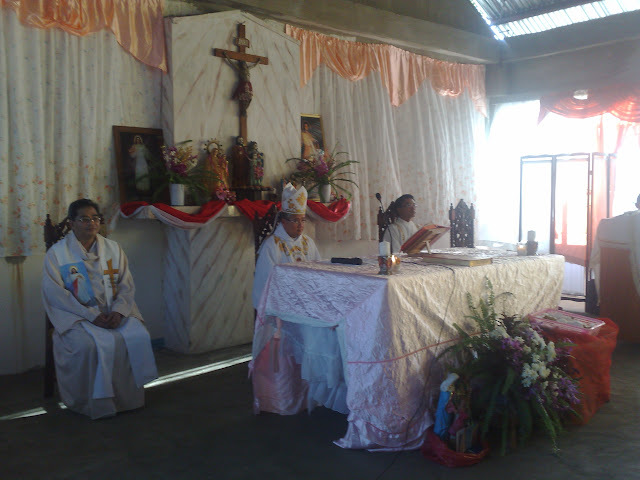 Oliver E. Mendoza, the parish priest, celebrated the Eucharist. The families had a great time at the Parish Center after receiving their gift-box. 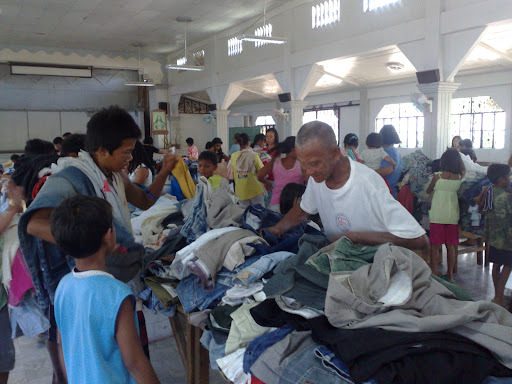 The Parish Center was transformed into a huge "Ukay-Ukay" center where the individual members of the families got to pick and try the clothes they liked and needed. The Parish Social Action team prepared and repacked the gifts, and supervised the whole activity.It was a fitting tribute to a Mother who gave her all, including her Son for the salvation of all. To see more pictures of “Panangaro na Ina, Regalo na Ina” gift-giving program, pleas click HERE. 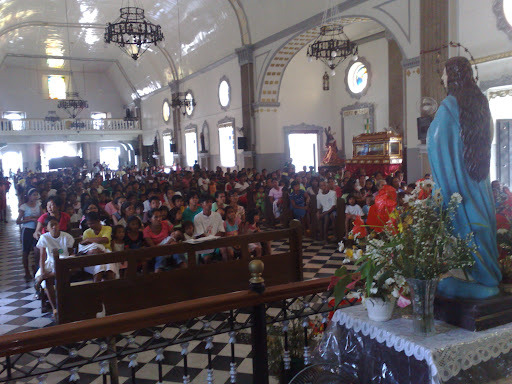 San Fabian – 5 December 2009. 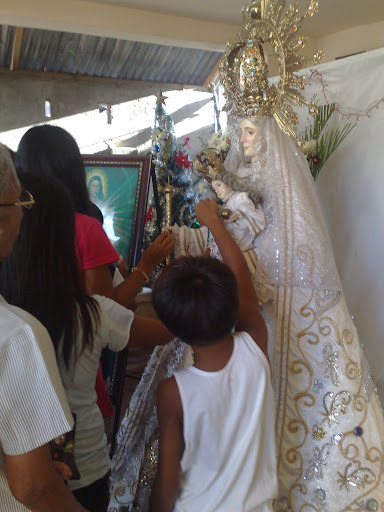 The residents of Barangay Narvarte went all out in welcoming the images of the Divine Mercy and the Blessed Virgin Mary last 28 November 2009. The adult formation program was held on 3 December 2009. The Farewell Mass held last 5 December at the yard of Casupang family was attended by an overflowing devotees. There were 16 children who received the sacrament of baptism. Fr. Oliver E. Mendoza celebrated the mass. 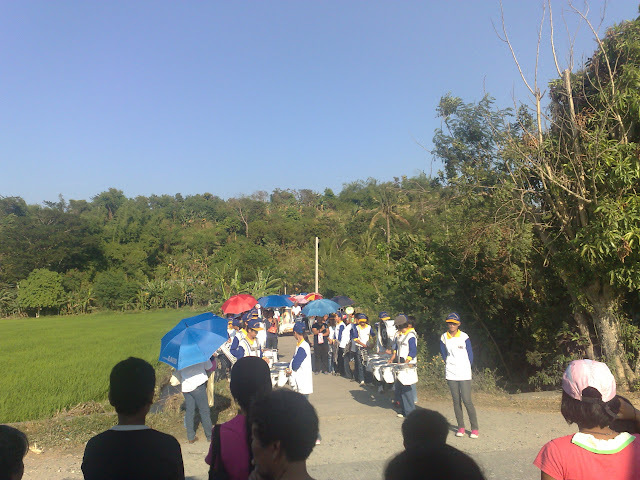 A procession was held to bring the images to the next host barangay, Brgy. Nibaliw Vidal. To see more pictures of the Barangay Visitation in Brgy. Nibaliw Narvarte, please click HERE. San Fabian – 5 December 2009. The HANDOG Parish Choir of the Parish of St. Fabian, Pope and Martyr, has qualified in the Semi-finals for the Manila Broadcasting Corporation (MBC) National Choral Competition. The Manila Broadcasting Company Choral Competition is a nationwide search for the best choirs in the country to compete in the MBC National Choral Festival from December 15 to 19, 2009. Grand finals will be held at the Aliw Theater. P100,000 will be at stake for each champion chorale in the Children’s Choir and Open categories. The top 20 children’s choirs and 20 outstanding vocal ensembles for the Open category will take part in the semifinals scheduled on Dec. 15-18 at the Star Theater, capped by the grand finals at the Aliw Theater on Dec. 19. Last year winners were Coro de Manila in the Open Category and Hiyas ng Pilipinas in the Children’s Choir Category. The Handog Choir is competing under the Open Category. It is bracketed with the defending champion Coro de Manila, and the choirs of the University of the Cordilleras, Tarlac State University, FEU Chorale and the Genesis Chorale. MBC has asked the choirs to render one novelty song each apart from the designated contest piece, and to submit three additional elective works from which the judges will choose on the spot which number they would like the choir to sing. Participating choirs will then be judged according to musicality (40 percent), presentation (30 percent), and audience impact (30 percent). Handog is under the leadership of Bro. Xavier Narvas. It is composed of the members of the Parish Youth Apostolate Committee. They sing regularly during the afternoon mass of Sundays at 4,30 PM. The whole Parish of St. Fabian, Pope and Martyr, is proud to have her own choir in such a prestigious competition. We are praying for your success! God bless you! Please click HERE for the Philippines Star report. San Fabian – 30 November 2009. In a solemn liturgical rite, Bro. Estephen Mark Espinoza was ordained to the Sacred Order of Deacons by the laying on of hands by the Most Rev. Socrates B. Villegas, DD, the Archbishop of Lingayen-Dagupan last 30 November, Feast of St. Andrew, the Apostle. A deacon is ordained to become a servant in the Lord’s Church, the closest co-worker of the bishop and the priests in a diocese. He serves the community by assisting in the celebration of the Eucharist. A deacon also serves by proclaiming the Gospel and through works of charity for the people of God. The ordination of Rev. Estephen was the first ordination to be held and celebrated in the Parish of St. Fabian, Pope and Martyr. In his exhortation to the ordinandus, Archbishop Socrates B. Villegas, DD mentioned that Rev. Estephen’s ordination is his first ordination as an Archbishop. Parishioners of St. Fabian as well as parishioners from the home parish of Rev. Estephen joined him and his family on this g race-filled celebration. The celebration began at 3:00 PM with a procession led by His Excellency Socrates B. Villegas, the Archbishop of Lingayen-Dagupan, and the Most Rev. 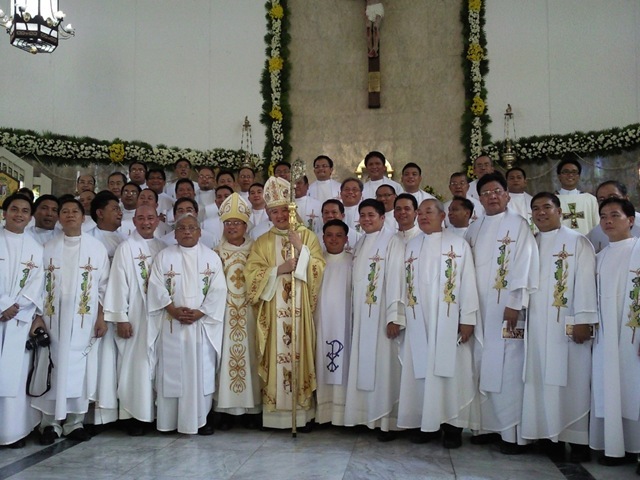 Renato P. Mayugba, DD, the Auxiliary, together with clergy of the Archdiocese. Rev. Fr. Arvin Soriano, formator of the Immaculate Conception School of Theology where the new deacon graduated, presented him to the Archbishop, as he testified to his worthiness of being ordained to the diaconate upon the recommendation of those concerned with his training at the seminary. The Commitment to Celibacy was given by the ordinandus for the sake of the kingdom in the service of God and man. The ordinandus was also examined by the Archbishop on the following: his willingness to be ordained for the Church’s ministry, his resolution to discharge the office of deacon with humility and love, to hold the mystery of the faith with a clear conscience and to proclaim the same faith in word and action as taught by the Gospel and the Church’s tradition. Finally, he was asked on his resolution to maintain and deepen a spirit of prayer appropriate on his way of life, to celebrate faithfully the liturgy of the hours. Before he was ordained, Bro. Estephen promised respect and obedience to Archbishop Socrates B. Villegas and to his successors. Bro. Estephen, just before the laying on of hands, prostrated himself at the sanctuary. This act of prostration was a manifestation of his humility. Because he is weak and sinful, the church needs the assistance of the saints so that God will accept the ordinandus into His service and give him the graces necessary as Bro. Estephen offers his life to the service of the Church. While prostrated, the litany of the saint was sung by the choir. The central part of the ordination rite is the imposition of hands of the Archbishop over the head of Bro. Estephen. This gesture is an eminent tradition in the Church since the time of the Apostles signifying election by God. This was done in silence. The prayer of consecration followed. After the prayer of consecration, the Rev. Estephen was invested with the deacon’s stole and the dalmatics, the official vestment of a deacon. Fr. Francis C. Posadas, the Team Moderator of the Epiphany of our Lord Parish, Lingayen, Pangasinan and the parents of Rev. Estephen, Atty. and Mrs. Marcelo Espinoza, assisted the newly ordained deacon in the investiture of the stole and the dalmatics. Msgr. Rafael S. Magno, Jr., the Chancellor of the Archdiocese of Lingayen-Dagupan, read the Mandate of the Archbishop regarding the assignment of Rev. Estephen. He was assigned as the resident deacon of the Parish of St. Fabian, Pope and Martyr. To see more pictures of the Diaconate Ordination of Rev. Estephen Mark R. Espinoza, please click HERE.